The luxurious Caneva Villa located in Tavronitis village built on a small hill that called Debla . The view is simply amazing, the aerea peaceful and quiet ideal for relaxation.Tavronitis is one of the most enchanting seaside sceneries of Western Crete. It is situated 20km from the city of Chanià, 39km from the airport and 9km from Plataniàs, the most cosmopolitan holiday resort in the entire prefecture. The area used to be called "Caneva" during the Turkish occupation. Later some locals named it Tavronitis after its impetuous river dashing through the village and sweeping everything along its path. Today, the village is noted for its magnificent beach, its crystal-clear waters and its serene natural beauty. Tavronitis is the first village you encounter when entering the province of Kìssamos and its position allows easy and fast access to some of the most important sights and picturesque beaches in the entire prefecture, such as Mènies, Falàssarna, Elafonìssi, Soùgia, Paleòhora and Sfakià. In the village, you will find supermarkets, a medical clinic, a chemist's shop and a wide range of restaurants and cafes. Villa consists of three levels. The first level comprises a large bedroom with living room, two bathrooms a heated indoor swimming pool and Hamam. The second level consists of a living room, a dining room with, a fully equipped kitchen and a toilet. The last level contains two bedrooms and two bathrooms. There is an outdoor 50-sq.m. swimming pool, where you can take a refreshing dip, enjoy your drink while working on your tan and relaxing embraced by a green yard full of lowers. At the other end of the yard, there is a wood-burning oven & BBQ, where you can prepare delicious dishes. Private parking space, heating and air-conditioning, satellite TV, laundry/dry cleaning service, safe, and cleaning service. What is more a hairdresser, a manicurist, pedicurist, as well as a face and body treatment specialist will be at your service upon request. Yard with grass and plenty of flowers 400sq.m. We stayed at the Caneva Luxury Villas for the first week in September. What a beautiful villa! The view from the kitchen balcony is truly amazing! The place is totally peaceful and serene. Giannis met us at the villa and gave us a tour of the property. He was kind and very helpful. Michalis was extremely helpful with any questions we had. Upon our request, Michalis ordered us a masseuse to give us massages at the villa. This truly was the best massage we have ever had! We recommend the restaurant "Argentina" which is about 10 minutes away by car. I can not forget to mention the most wonderful dish we received from the Giannis & Michalis's mother! Our guests and we truly enjoyed it. We were treated very kindly by the entire Epitropakis family. This is an extremely beautiful villa, and we would highly recommend it! Thank you so much for your kind words and for taking the time to share your Caneva Luxury Villa experience with our future guests! We really feel this review sums up all the strong points of our place. We are happy that you enjoyed staying with us and we are looking forward to welcome you back in the future! 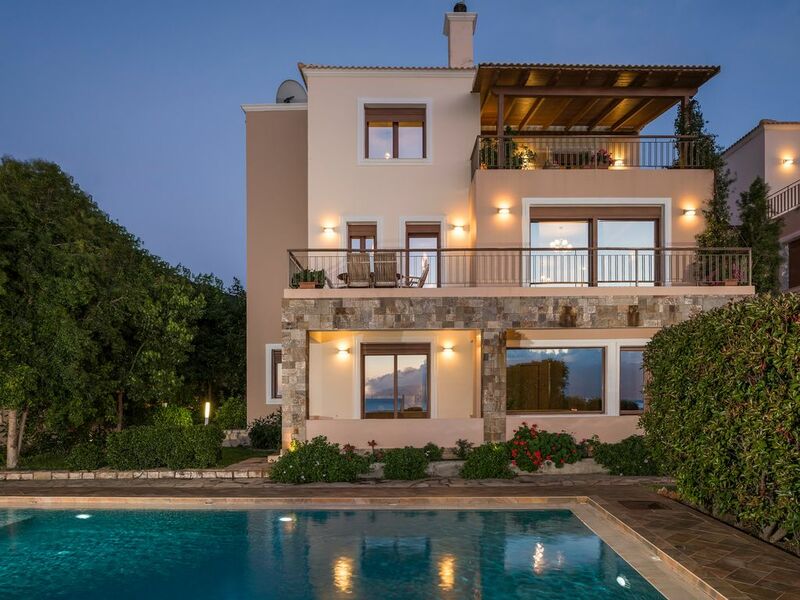 This is a beautiful villa set on a hillside to catch the Cretan breeze, and the beautiful views out to sea. We enjoyed some amazing sunsets. Michalis and his Mum looked after us so well, providing us with lots of information about where to visit and delicious food from their organic farm. I don’t think we have stayed in any other villa where the hospitality, care and support has been so great. It is a short walk to the village shops which include a wonderful butchers, bakers and general store. It’s very easy to eat well here! We are a family of six and there was plenty room for us all, including the very generous outdoor pool and the indoor plunge pool. We had a wonderful holiday in this fantastic place. Thank you for choosing our villa for your vacations in Chania. We especially thank you for this amazing review and rating. We are glad to see that the place has exceeded your expectations, we really hope to be able to welcome you and your family again in the future! Extremely impressive, maintained to a very high standard with an excellent view. We stayed here for 7 nights in luxurious conditions, spoilt with extreme hospitality by the whole family. The attention to detail was outstanding right from the offset. The privacy the villa offered was just what we required. Thoroughly enjoyable holiday that we would highly recommend. Me and my family would like to thank you for your kind words and rating. We really appreciate you taking the time to share your experience. It's a pleasure to read that you enjoyed our services and hospitality. We look forward to welcoming you back to the villa in the future.